Ann-Marie Robinson is an Irish artist specialising in ceramics. 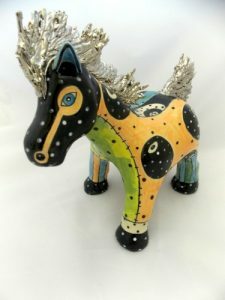 Her pots are all highly individual and are all handbuilt and hand decorated. They are all one-off pieces. Ann Marie was born in Lancashire and moved to Northern Ireland in the 1970’s. she gained an honours degree in ceramics from the University of Ulster in 1982 and has been creating pots ever since. She has worked on many prestigious private collections including former Irish President Mary Robinson, Senator George Mitchell, the late Dr Mo Mowlam and Mary Peters OBE. Her work can also be seen in the Ulster Museum, the National Museum of Ireland and the public collection of the Arts Council of Northern Ireland. She has been featured many times in art journals such as the Ceramic Review, Irish Arts Review and most recently in the best of Irish Ceramic Sculpture publication. 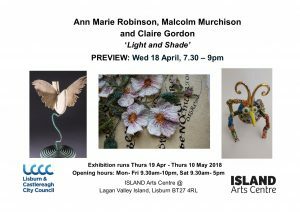 Ann Marie has also worked on many public art commissions including floor games in the Royal Victoria Hospital, Belfast and a huge ceramic mural for the Causeway Hospital, Coleraine. She has been teaching ceramics and arts for many years with different groups. She has shown widely throughout the UK, USA and Germany and today divides her time between making pots and looking after her three children.